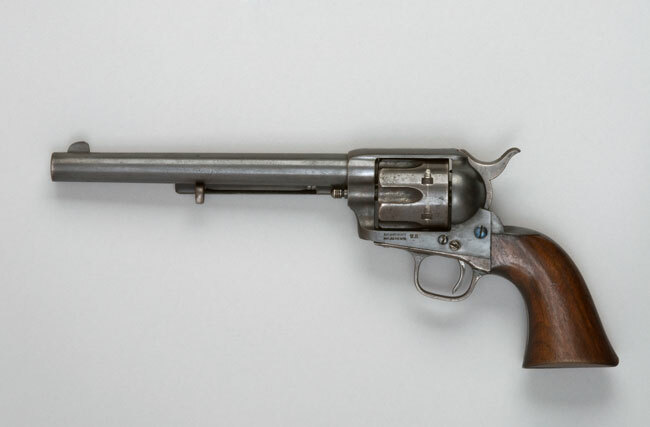 On July 23, 2011, the Autry National Center Museum in Los Angeles, California, will unveil an exhibition in the Greg Martin Colt Gallery that explores the history of Samuel Colt's revolutionary revolver in the American West. The exhibition looks at the impact the Colt revolver had on the American frontier and the contemporary West, with a special section devoted to the Colt Single Action Army Model Revolver. The firearms featured in the exhibition include pieces of historical significance, opulently engraved specimens and very rare models. Highlights include an early prototype revolver, Theodore Roosevelt's Single Action Army Model Revolver and the first modern revolver designed by Tiffany & Co.
An array of art and artifacts relating to the Colt revolver will also be on display. Highlights include Samuel Colt's first patent, a lithograph by artist George Catlin and a rampant colt sculpture. All of the artifacts in the exhibition are from the permanent collection of the Autry National Center. Many were generously donated to the museum by Autry members and supporters.